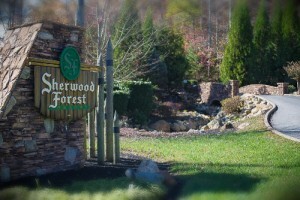 Nestled along a ridgeline in Pigeon Forge, Sherwood Forest Resort is a quaint community with magnificent homes. The stone bridge harkens back to the neighborhood’s literary name, while the large gates with stone pillars give a sense of privacy as well as increase security. The winding roads provide guests with the best views of the Great Smoky Mountains National Park. As a rental resort community, Sherwood Forest offers amenities and a high return on investment, all nestled against a backdrop of mountains and in a highly convenient Pigeon Forge location. A seasonal outdoor pool is just one of the amenities at Sherwood Forest. A cohesive look, complete with stonework, timber cabins, paved roads and breathtaking views around every bend, is another benefit of this community. The large iron gates provide privacy and security while hinting at exclusivity. Just a short drive from the Smoky Mountains National Park, Gatlinburg or Sevierville positions Sherwood Forest in an ideal location. The lure of staying minutes from downtown Pigeon Forge and all the attractions, restaurants and entertainment that come with it are a part of what make Sherwood Forest a rental haven and is sure to provide a high return on investment. In a rental resort, the return on investment is more secure. On-site staff at the entry gate handles check-in for renters, and game consoles are available for rent as well. A resort community provides many of the same services as a hotel with the privacy and convenience of a cabin. The limited entrance into the neighborhood and the presence of check-in attendants provides increased security of the property, putting your mind at ease when you’re an owner renting a unit out. The lush landscaping and majestic views make this neighborhood a serene escape, complimented by the traffic limited due to the entry gates. The rolling mountains, shrouded in mist, are the perfect backdrop to your cabin and are best enjoyed with a steaming mug of your favorite drink in hand from your own porch or hot tub. Are you interested in owning property in Sherwood Forest? The Terrell Team can guide you to the perfect cabin. Owning your dream mountain home may be closer than you think. We have listings in Gatlinburg, Sevierville and Pigeon Forge, ranging from cozy cabins to distressed homes.